A Polished Cream Marble Stone Wash Basin makes for a fantastic addition to any modern bathroom. Marble Mosaics Ltd. As these sinks are carved from natural stone there can be variation in depth of shade/colour/veining each sink is totally unique. This preserves the individual shape of the stone. So stands the hand sink clear of usual oval ceramic sink. While the polished inner surface of the sink reveals the unique marbling of river stone, the basin from the outside has the natural rustic structures of stone. Grey Marble Stone Basin 40 cm ( WA002 ) for bathrooms. A handmade Polished Grey Marble designer Stone Basin / Sink . As these sinks are carved from natural stone there can be variation in depth of shade/colour/veining each Marble basin is totally unique. As these sinks are carved from natural stone there can be variation in depth of shade/colour/veining each individual sink is totally unique. Marble Mosaics Ltd. With our ever expanding range of quality tiles @ unbeatable prices we are sure you will be coming back for more. Maintenance of natural stone is very simple. Washbasin should be often rag-roll with wet cloth just with water, eventually with mild detergent. It will protect against the ingress of dirt and facilitate future cleaning. The bewildering variety of designs, colours and shapes allow you to select the perfect washbasin to your interior. 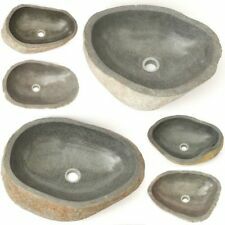 Stone washbasin will be a good and practical choice not only for bathrooms, but also for gardens. WASHBASIN RIVER STONE RSB1 40 free soap dish. Maintenance of natural stone is very simple. Washbasin should be often rag-roll with wet cloth just with water, eventually with mild detergent. It will protect against the ingress of dirt and facilitate future cleaning. WASHBASIN RIVER STONE RSB2.5 free soap holder. Maintenance of natural stone is very simple. Washbasin should be often rag-roll with wet cloth just with water, eventually with mild detergent. It will protect against the ingress of dirt and facilitate future cleaning. --- Yellow Onyx stone bathroom hand face wash basin bowl --- Ideal design for mounting on the counter top or partially counter sunk --- Please note that these basins are made from natural stone and therefore the colours will vary --- Basin diameter is 350mm --- The basin depth is 120mm --- This deal also includes a chrome basin waste click clack push spring type. Stone Sink Number 233. L- 38cm, W- 32cm, H- 15cm. Stone Basin from Ombak Furniture. Modernisation in the far-eastern country has seen many of the old style wooden buildings replaced with brick and mortar. Stunning rectangular stone sink from Ombak Furniture.50 x 40 x 12.5cm. Beautifully hand-crafted, natural stone sink finished to the highest quality. Polished on the inside and rough hewn on the exterior. WASHBASIN RIVER STONE BURU P. Maintenance of natural stone is very simple. Washbasin should be often rag-roll with wet cloth just with water, eventually with mild detergent. It will protect against the ingress of dirt and facilitate future cleaning. WASHBASIN RIVER STONE BURU K. Maintenance of natural stone is very simple. Washbasin should be often rag-roll with wet cloth just with water, eventually with mild detergent. It will protect against the ingress of dirt and facilitate future cleaning. WASHBASIN RIVER STONE RSB1 28 free soap dish. Maintenance of natural stone is very simple. Washbasin should be often rag-roll with wet cloth just with water, eventually with mild detergent. It will protect against the ingress of dirt and facilitate future cleaning. Stone dish 65 cm. -You buy a stone shell of natural stone in the "rust" look. -For indoor and outdoor area. You should therefore. Save the text of the contract with the technical possibilities of your computer (E.g. screenshot) itself and if necessary using the print function of your browser a USD jerking. As these sinks are carved from natural stone there can be variation in depth of shade/colour/veining each stone basin is totally unique. MAXIMUM WEIGHT 1000 KGS. With our ever expanding range of quality tiles @ unbeatable prices we are sure you will be coming back for more. Stone Sink Number 240. L- 36cm, W- 32cm, H- 15cm. Stone Basin from Ombak Furniture. Modernisation in the far-eastern country has seen many of the old style wooden buildings replaced with brick and mortar. Stone Basin Number 602. L- 46cm, W- 42cm, H- 15cm. Stone Basin from Ombak Furniture. Stunning, natural stone sink. Modernisation in the far-eastern country has seen many of the old style wooden buildings replaced with brick and mortar. Classically styled rectangular basin from Ombak Furniture.50 x 35 x 12cm. Beautifully hand-crafted from marble, natural stone sink finished to the highest quality. These basins create a stunning centrepiece to any bathroom or washroom. Stone Sink Number 211. L- 41cm, W- 32cm, H- 15cm. Stone Basin from Ombak Furniture. Modernisation in the far-eastern country has seen many of the old style wooden buildings replaced with brick and mortar. Stone Sink Number 279. L- 50cm, W- 41cm, H- 16cm. Stone Basin from Ombak Furniture. Modernisation in the far-eastern country has seen many of the old style wooden buildings replaced with brick and mortar. Stone Sink Number 280. L- 35cm, W- 36cm, H- 16cm. Stone Basin from Ombak Furniture. Modernisation in the far-eastern country has seen many of the old style wooden buildings replaced with brick and mortar. WASHBASIN RIVER STONE RSB MINI 39. Maintenance of natural stone is very simple. Washbasin should be often rag-roll with wet cloth just with water, eventually with mild detergent. It will protect against the ingress of dirt and facilitate future cleaning. ---Stunning Black Marquina marble basin (customer return) ---Medium chip on the rim which can be seen in the photos. ---No waste is included. ---Modern designer look ---Diameter and Depth - WR304 =300mm x 110mm ---Ideal for mounting on counter top or partially counter sunk. 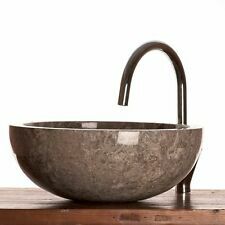 Stunning bowl wash basin from Ombak Furniture.40 x 15cm. Beautifully hand-crafted from marble – a natural stone sink finished to the highest quality. Also available in Black or Cream. Modernisation in the far-eastern country has seen many of the old style wooden buildings replaced with brick and mortar. Stone Basin Number 203. L- 36cm, W- 32cm, H- 15cm. Stone Basin from Ombak Furniture. Modernisation in the far-eastern country has seen many of the old style wooden buildings replaced with brick and mortar. --- Red marble round bowl bathroom hand face wash basin --- Ideal design for mounting on the counter top or partially counter sunk --- Please note that these basins are made from natural stone and therefore the colours will vary --- Basin diameter is 350mm --- The basin depth is 120mm --- This deal also includes a chrome basin waste click clack push spring type. Design precedes function but harmonizing both creates value. maximizing functionality is one of our key guiding principles. 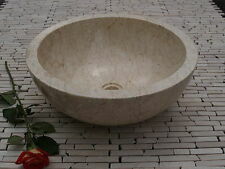 Madeli Navona Round Stone Vessel Sink. Navona Collection. The stone sink must be generally considered in a relative sense as granite is a product of nature and subject to variations in color and spotting. These basins create a stunning centrepiece to any bathroom or washroom. 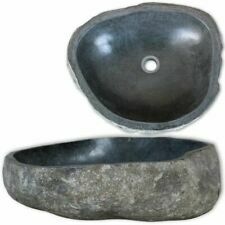 Stunning bowl wash basin from Ombak Furniture.40 x 15cm. Polished on the inside and a rough carved pattern finish on the outside – a beautiful combination! LOTOS WASHBASIN RIVER STONE C. Maintenance of natural stone is very simple. Washbasin should be often rag-roll with wet cloth just with water, eventually with mild detergent. It will protect against the ingress of dirt and facilitate future cleaning. ---Stone bathroom wash basin --- Ideal design for mounting on the counter top or partially counter sunk - These basins go well with tall basin mixer taps. --- This is a natural stone product, variations in colour may occur --- Basin diameter is 300mm and The basin depth is 110mm. WASHBASIN RIVER STONE RSB2 11 free soap holder. Maintenance of natural stone is very simple. Washbasin should be often rag-roll with wet cloth just with water, eventually with mild detergent. It will protect against the ingress of dirt and facilitate future cleaning. Stone Sink Number 243. L- 50cm, W- 48cm, H- 15cm. Stone Basin from Ombak Furniture. Modernisation in the far-eastern country has seen many of the old style wooden buildings replaced with brick and mortar.